Great quotes this week and remarkably, I could identify almost all of them, of at least which movie they come from. A couple of those, Garry can run the dialogue line by line. BIG Stewart fan! He made some great movies. I am sure there are more quotes, but I have not seen all of his films. Good quotes. 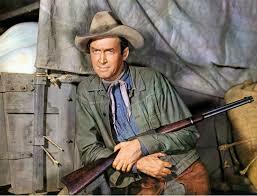 Jimmy Stewart is one of my favourite western movie stars. Liberty Valance must surely be in the all time top 10 westerns? Liberty Valance is definitely one of the all time greats. Aunt Bee? That Frances Bavier? I’ve never seen her in anything other than the Andy Griffith Show. Yep, that Frances Bavier. It’s the only other thing I have seen her in, too. I think she did Broadway more than anything. Definitely one of the greatest Western Stars of all time. Just an outright great Actor who could deliver a line. He was good in any kind of movie. Stepin Fetchit? How long did his agent spend thinking up that one? And I thought Rip Torn and Slim Pickens had the punny names taken already. It was controversial. That name conjures up images of a slave following the orders of a master. Step and fetch it.